This past weekend was a good one: I caught up with a girlfriend, celebrated Dad, and even stopped by the Wong Fu Productions event in Vancouver (I’ve been watching their videos for ages & had a completely awkward fan girl moment as evidenced here – big props to D for speaking for me when I had zero words ;). Another highlight was unexpectedly finding my Fall bag for a ridiculously good price at The Bay: I love that its minimalist shape allows it to pop in a subdued way. Its also happens to be my lucky number, so it was clearly meant to be! How was your weekend? I had no idea they sold Proenza Schouler at the Bay! How crazy is that? The Bay has evolved so much in the past few years, it’s hard to keep up. Anyways I love this look it’s super cute and super chic. Congrats on the bag find! A friend just scored the same bag but in black from Barney’s. 🙂 Think yours is neutral, much like black. What a gorgeous look! 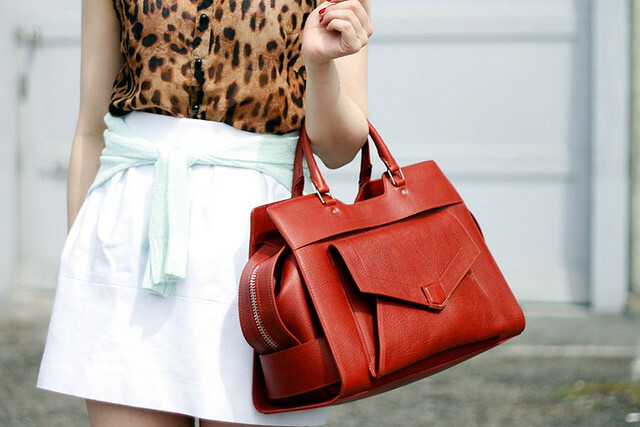 I love that red bag against the leopard top! How much was the bag after the discount?? you look great I loooove leopard print! Love the muted pop as well as those heels. Very cute! that bag is amazing girl! it’s all i could stare at! perfect for fall! I love how you tied the sweater around your waist for a more casual vibe. Love the new bag, Jen! That bag is such a beautiful rusty orange color! I love it and can see it fitting your fall wardrobe perfectly! Loving those pumps as well! I love that bag! It’s so amazing! Cute outfit. Love the pop of mint with your pieces. Great look. Love that sweater. There are many other uses to get a fashion Proenza Schouler PS1 Bag bag but what exactly is most focused is the fact they add beauty and also help. 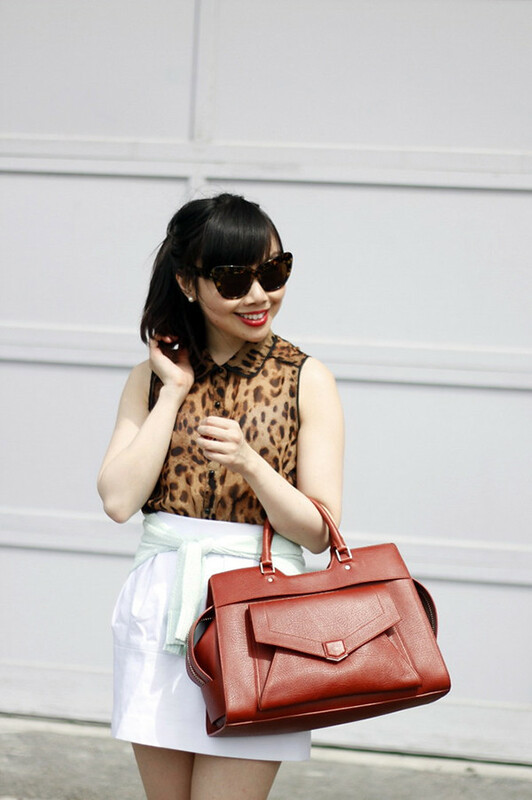 Mint + White + leopard… omg. This is a great work outfit… You are working this. I’m surprised the WongFu guys didn’t go non-verbal when they saw you.